gown hanging in a bag. "Its after the wedding." Why not make a wedding dress donation to a charitable organization? The proceeds from the gown will be used for a good cause. Plus its tax deductible too! Some charitable organizations that come to mind would be Goodwill Thrift Store, Childrens Hospital Thrift Stores along with some others. But here are some others to consider whether you are looking to sell or want to buy an affordable wedding dress. Making Memories is a non-profit organization. This organization benefits men and women who are fighting breast cancer.The funds from gowns sold help grant the wishes and dreams of men and women losing their fight against breast cancer. About half of the bridal gowns are brand new and come directly from wedding dress designers. Most gowns sell between $99 and $799 even though some retail as high as $8000. Also, individual brides donate wedding dresses. If you are looking to buy a gown . . . the organization hold bridal gown sales all over the country. To find out the dates for the next sale click on the link above. Bridal Garden is a not for profit organization that benefits childrens charities from the sale of pre-owned wedding dresses. Heavenly Angels In Need is an organization that help grieving parents of babies that die in the hospital who would like to see their baby dressed in burial attire but cannot afford it. Heavenly Angels receive donated wedding dresses, take them apart and use them to make burial garments for parents to bury their babies in. Your wedding dress donation is directly used for a worthy cause. Get your bridesmaids in on this idea too, since they also take donated prom dresses and bridesmaids dresses. The The I Do Foundation will sell your dress through their consignment partner. They will donate 20% of the proceeds from the sale of your dress to the charity of your choice. The remaining funds are used to support the I Do Foundation's ongoing work to encourage charitable giving at weddings. In addition, you may be eligible to receive a tax deduction for the value of your dress donation. Another wedding dress donation organzation possibility is the Bride Project. It is an organization that has a two fold purpose. They provide brides a way to have a beautiful wedding dress of their dreams at a very affordable price. And all the proceeds go to supporting cancer charities. 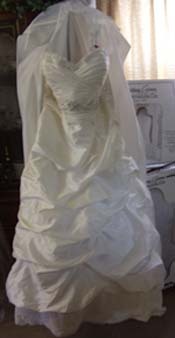 Most wedding gowns are less than 5 years old, two - thirds of them are "new" condition donated from commercial partners. And the other third are donated from brides who want their gown to go to a use. Donate My Dress and The Princess Project are organizations that allow women to donate prom and special occasion dresses for good causes. Donate My Dress is the first national network to bring together local dress drive organizations in one place. They help you find one in your local area so that once you finish with your dress you can help someone else have their dream night. The Princess Project take in donated prom dresses to help girls who cant afford prom dress in the San Francisco Bay Area in California. Some bridesmaids dresses are stylish enough to use as a prom dress. Wedding Dress Donations - How Much Is Tax Deductible? When it comes to taking a tax deduction on clothing items you have to use the "fair market" value. Fair market value would be what a thrift store would be able to sale something for or what you would pay to a consignment shop. This holds true for bridal gowns. This would mean that you would not be able to deduct anywhere near the original price you paid for your gown. In most cases, you would be looking at half the original price or less. If you feel your gown is worth more than $500... then you would want something in writing from the charitable organization or an appraisal made of the dress to document the price. For more information about this and whether other expenses you incur to get your bridal dress ready to donate, such as, dry cleaning the gown and mailing costs are deductible check out this article. "So after your wedding day, why not donate your wedding dress to one of these organizations." If you are not going to turn your dress into a family heirloom, then "donate a wedding dress to the charity of your choice." "You will find satisfaction in the fact that your wedding dress donation, help to provide happiness for others."